Tucked away on 300 lush, tropical acres in Aventura, a city between Miami and Fort Lauderdale, the condominiums of Turnberry Isle South are the epitome of luxury living in south Florida. Rising 30 stories above the gleaming waters of Turnberry Isles’ exclusive marina, Turnberry Isle South offers its residents breathtaking views of the cityscape at all times of the day. Constructed in 1980, the condominium consists of 260 luxury units. The condominium had undergone two previous roof replacements and, at the time, had a gravel-surfaced, coal tar pitch roof with more than three-and-a-half inches of insulation that had surpassed its serviceable life. In January of 2010, Jonathan Schepps, the property manager, and John Belardo, the facility engineer at Turnberry Isle South, attended Commercial Roofing 101, a two-hour educational class taught by Gregg Wallick, Owner and CEO of Best Roofing, that focuses on the principles of roofing and the relationship to property management. Following the class, the men requested a visit to their property in order to assess concerns they had about their roof. Unfortunately, their concerns were validated, and the roof needed to be replaced due to excessive moisture trapped beneath the roof’s surface. Enough money had not been set aside to cover the cost of the roof replacement so a replacement cost budget and action plan on how to keep the building dry was provided until such time as the association was in a financial position to replace the roof. passion for the industry is the driving force behind Best Roofing’s outstanding reputation, growth, and success. He has served as the past director of the National Roofing Contractors Association and retains numerous licenses in the roofing field. 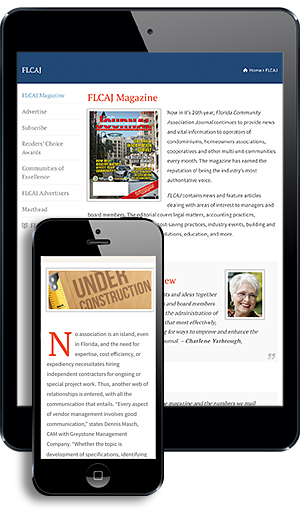 He is a frequent contributor to Roofing Contractor and serves on the editorial advisory board. Gregg is especially proud of being a husband and the father of six children, three dogs, and five cats. 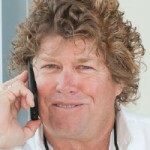 For more information, call (888) 723-BEST (2378) or visit www.bestroofing.net. A major challenge facing the board of directors and property manager was how to coordinate the replacement of the common area roofs in conjunction with the replacement of the three rooftop penthouse roof systems. Schepps was faced with how to get all four stakeholders (three penthouse owners and the board of directors) to agree on what products to use, design considerations, who to hire as the roofing contractor, and how they would handle the various other-related trades, such as plumbing, electrical, mechanical, doors, etc., that were impacted with the roofing replacement project. The board of directors hired SPEC Engineering (Swaysland Professional Engineering Consultants) to write the roofing project specification. Logistics are always an issue on projects like this where there is not an open area efficient for construction staging. One of the challenges faced during the course of the project was where a sizable crane required to remove the old roof and deliver the new roofing materials could be placed. After significant evaluation, a decision was made to locate the hoisting equipment on the roof versus on the ground so that the limited staging area could be used for material storage and trash disposal roll-off containers. This was further complicated by the fact that the only area for on the ground staging was the delivery area for the condominium and that needed to remain operational for normal daily deliveries. Turnberry Isle South is 80 percent occupied with seasonal owners who spend their winters in Florida. The board of directors wanted to hold off on the roof replacement until after the majority of the residents traveled north for the summer, which put the project start date right in the middle of rainy season. 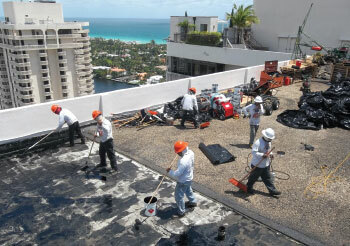 Replacing a roof during the weather patterns typically encountered during the summers in south Florida is very risky. June to November is hurricane season and, during the summer months, it rains every day in some parts of south Florida. The process started as planned. Daily progress reports with job site pictures were provided to all the stakeholders in the project. Each week, everyone involved and all trade contractors would meet and review the progress and discuss next week’s plan. The master plan was updated by coordinating all the various activities and inspections as required by all governing entities. When the project was finally started, all the stakeholders were on guard for change orders for unforeseen conditions, which many projects like this encounter. The roofing team kept the stakeholders informed of the majority of possible, additional cost considerations prior to starting the project. They had built into the base contract pre-negotiated unit prices to handle any possible additional costs. Upon completion of the project, the amount of additional costs associated with completion of the project was insignificant.